LIMIT 4 TICKETS PER PERSON, any orders beyond 4 tickets are subject to rejection. 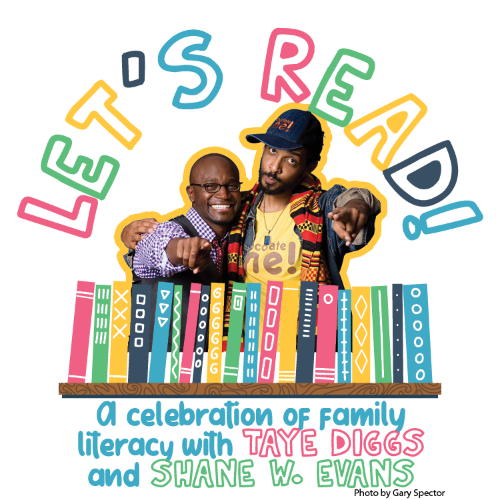 We are thrilled to announce screen and Broadway actor and children's book author Taye Diggs will be joining illustrator and local artist Shane W. Evans for an event to benefit Literacy KC. Let’s Read! A Celebration of Family Literacy will be held at UMKC’s Pierson Auditorium on April 27, 2019 from 3:30-5:30 PM. This family friendly event will celebrate positive male role models of color as well as representation in children’s literature. We hope you can join us for a panel discussion, Q&A, celebrity story-time, and a post-event VIP meet & greet, where guests will take photos with Taye and Shane. This event will celebrate family literacy and diversity in children's literature, like in Taye and Shane's books: Mixed Me!, I Love You More Than. . . , and Chocolate Me!. Taye Diggs is an actor whose awards include an NAACP Image Award and a Screen Actors Guild Award. His performance credits include motion pictures (How Stella Got Her Groove Back, Chicago and The Best Man), Broadway (Rent, Hedwig and the Angry Inch, Wicked), and television (The Good Wife, Private Practice). Shane W. Evans is the illustrator of numerous award-winning books for children, including Underground, winner of the Coretta Scott King Illustrator Award; We March, a Kirkus Reviews Best Book of 2012; and Osceola, winner of the Boston Globe-Horn Book Award. Sponsorship opportunities include a meet and greet with Taye and Shane and books co-signed by the author and illustrator. This is a can't miss event! Click here to see sponsorship opportunities.